The idea of the “Compassion Is..” bench was originated by David Breaux. David was able to gain permission to build it on the property of the AT&T Company, who owns the property. 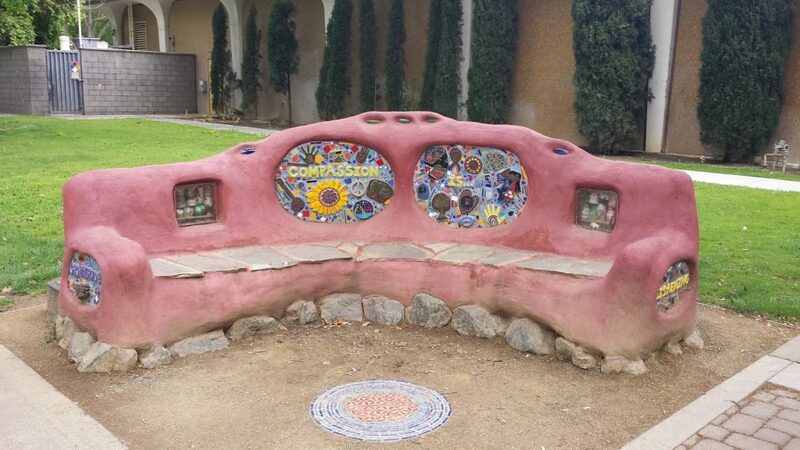 Built in the “Cob” style, Mr. Breaux was able to enlist the assistance of Brennan Bird, with the ceramic artists Donna Billick and Mark Rivera creating specialized pieces for the mosiac areas. A community project from start to finish, the piece is catty corner from the Central Park, and a favorite of the Farmer’s Market crowd.